Fermilab physicist Giorgio Apollinari will succeed Marc Ross as head of the laboratory's Technical Division, Fermilab Director Pier Oddone announced this week. Ross has begun a new position as project manager for the Engineering Design Report for the International Linear Collider. Apollinari will take over as TD head on September 1. "Giorgio Apollinari brings a great breadth of experience to Technical Division management," Oddone said. "His work on advanced detector and accelerator technologies, and his days as an experimenter on CDF, give him a remarkable perspective on Fermilab science and technology at this key moment in the life of the laboratory." Apollinari, who currently heads TD's Superconducting RF Development Department, came to the U.S. from his native Trieste, Italy in 1986 as an exchange scientist from the University of Pisa. After returning to Europe for a stint on CERN's ALEPH experiment, he came to the U.S. for good in 1991 as assistant professor of physics at The Rockefeller University. 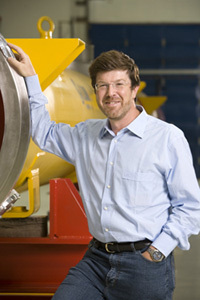 While at Rockefeller, he joined the CDF experiment, where in 1995 he became manager of a large subdetector upgrade project. In 1998 he joined the Fermilab staff, heading the successful Fermilab-led international effort to build specialized muon detectors for the Compact Muon Solenoid detector at CERN's Large Hadron Collider. In 2004, a growing interest in superconducting accelerator technology led him to join Fermilab's R&D effort for a high-intensity neutrino source and to his appointment as head of the SCRF Department. "Clearly, SCRF is a basic enabling technology, essential not only for Fermilab's first priority, the ILC," Apollinari said, "but also for a potential Project X and perhaps in the future for a muon collider. Since Fermilab will play a leadership role in the development of this technology for the ILC, the goal of the Technical Division in my tenure will be to acquire and provide the technical expertise and knowledge that the laboratory and the particle physics community will need as we take the next steps forward." Apollinari said he plans to rely heavily on the Division's many outstanding technical experts in making the best technical choices in all aspects of this endeavor. He will also support the high-field superconducting magnet technology, "a Fermilab flagship program for many years," Apollinari said. "We don't want to lose our hard-won world leadership in this key field." Apollinari will strive to embed safety in everything the Division does: "Our paramount goal is to send each employee home safe and unharmed at the end of every work day." Ross was appointed TD head on October 1, 2006. Last May, Global Design Effort Director Barry Barish announced Ross's appointment to the position of project manager, one of a team of three, for the Engineering Design Report phase of the ILC. "Marc Ross's assignment as the Americas manager of the ILC EDR, along with Giorgio Apollinari's appointment as head of the Technical Division, will strengthen Fermilab's position as we plan our future," said Associate Director Steve Holmes. "These assignments will support our leadership in the ILC and develop a strong technology program that will serve Fermilab well whatever the future brings."